Agriculture retains its central place in the lives of the communities of the Sierra Norte and is the most common occupation of community members. Narrators talk of the crops that they cultivate for family or community consumption, and for sale - and of what developments there have been. A farmer from Tiltepec (Mexico 3) reports that his "forefathers" grew "corn, beans, sugarcane and chilli". A young man in the same community (Mexico 9) indicates that, apart from coffee, little has changed: ".I just dedicate myself to growing corn, and I make a little panela (unrefined sugar) and.a little bit of coffee. [as well as] beans, a little". A fellow community member (Mexico 13) is enthusiastic about the addition of coffee to local planting: ".I arrived here and began working with coffee. That was my ambition; it was my life and it's been good for me; and it's what I'm doing now. I'm getting older but I've got enough to support myself, because the coffee plantation is producing well. Of course, I can't work growing corn now, but the coffee gives me enough to get all my things.". Since the interviews were gathered, however, coffee cultivation has proved insecure, due to price changes and other market conditions. Such is the mosaic of micro-climates in the mountains and valleys of the Sierra Norte that the territory of many of the area's communities embraces two, and sometimes three, climatic zones. Most often referred to is tierra caliente or "hot lands", as distinguished from tierra templada (temperate lands) and tierra fría (cold lands). Ixtlán's territory, long and thin on a map but ranging from 200 to 3,200 metres in height, benefits from all three zones. These provide conditions suitable for different crops, explains one narrator (Mexico 5): ".yes, it's a different place there [lower down the river valley]. Things grow over there that don't grow here. 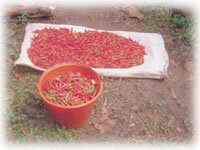 For example you can grow chilli there, which doesn't grow here." Concern is expressed as to declining fertility of soils. Some disapprove of clearing new fields in the forest, rather than reusing existing land after appropriate fallow periods: ".we're cutting down the old forests to be able to sow [crops]. [our forefathers] didn't do this [back] then; they only worked where there are overgrown fields now. and the earth is losing its power. It'd be better if we looked for a place that can be cultivated again to be able to leave the forest higher up." (Mexico 3). He feels there is less care and respect now for the land: ".they didn't sow much, but they still got good harvests because there was more respect for the land. They asked mother earth to give them a good harvest. [they] gave an offering to the land to be able to work it; now.we are just laying hands on the earth [without caring about it]." The community of Yavesía has used its valley location for fruit cultivation, including for sale, locally and in the area around the state capital: ".it's a village that grows all types of fruit - peaches, plums, quince, pears, apples, nuts, avocados.They go to Ixtlán, Oaxaca or Tlacolula to sell, and it's good" (Mexico 12). A fellow community member (Mexico 14) confirms the view that this has been successful: "The village has lived from fruit cultivation more than anything, the production has been a big success." One other new initiative sometimes mentioned is a mushroom farm. A resident of Ixtlán (Mexico 15) suggests that existing smallholdings should be worked as part of larger, collective farms on the basis that better organisation would attract support and be more productive: ".we haven't managed to make a successful improvement in our organisation, have we? We haven't been able to organise five, 10 or 15 farmers to have one sole [plot of] land and take advantage of all this land to plant, because in that way we could get help from the government. Things work better in a group.I admit that it's a little difficult because of the topography of the land, but at the same time it would be possible to get round this if there was an effective organisation." ".there weren't pests like there are now..what we plant is half for these creatures and half for us"
"My parents' life consisted of work. For example, in February they.prepared the soil for planting corn.potatoes.broad beans - and later they did some other work while the plants were growing in the field. In May the weeding of the field took place. In June, it was time to put more soil around the plants. In August the corn was there [to harvest]. My father and my brothers worked only on communal land. We had to submit an application for one hectare or whatever size we wanted. to the comisariardo de bienes comunales (office responsible for community property). After they had considered it, we could work, cutting down the trees to prepare the soil [for planting]. [Then] we let it dry out and then.burnt the branches, and the thick wood was used as charcoal.it was oak." "It isn't customary for the people here to use fertiliser - manure, yes, but none of that [chemical fertiliser], just the pure force of the earth. I remember that once I used [a chemical]...for killing the weeds but then I realised it was damaging the plants; some became very sad looking. Well, as they became dull like that I don't use that any more. Those chemicals damage the plants. [Weeding] is better with machetes (big knives)." One of the points [about coffee is].it helps us to stop clearing the forest. That's what I would like to say. to some of the people from La Luz. They have so much land! And they are still going to that side to clear the forest - such precious places!. They're abandoning [their fields] and opening up more forest. Instead of leaving them, they should plough them.We've farmed the land year after year, without fertiliser, and it gives a good harvest. "Everything [here] is changing . One needs to work much more now.to be able to support oneself. Even the crops produce very little. [People] used to sow a little and they got a lot, and now we have to sow a lot to get anything. Well, I think it's because of the change in the weather."